Our carrying pouches have been specifically designed and tested for marsupials, although they can be used for other small animals. Each pouch is hand crafted of top quality material to ensure your pet's comfort and safety. All are lined, have a leash clip, and are machine washable! These pouches are not mass produced by some big company or giant machines. Each pouch is individually hand made by the designer herself - Chris Thompson, a well-known and respected breeder of wallabies. Care is given so that any material used in the making of these pouches is sure to be of the best quality so toe nails have a smaller chance of catching and snagging on the material and the material is not of the kind that will shed which can cause health problems if the animal would happen to swallow any loose material. Because all of our pouches are hand-made we can not guarantee any certain color of pouch. 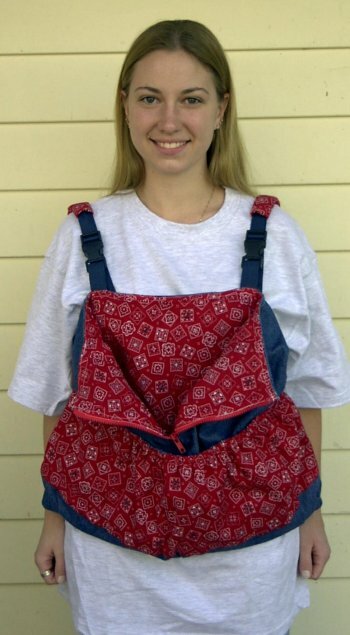 Pouches can be specially made to fit animals other than Kangaroos & Wallabies. Please allow extra time when ordering special size pouches. Discreetly carry your pet in this wonderful soft cotton denim pouch. It has 3 handy front pockets to carry your wallet, bottles, food or other pet supplies. Velcro is used to assure safe closure on pouch and outside pockets. Lined inside. Machine washable in cool water. Available in one size only. Helpful Hint: Place hand warmers in the outside pockets to keep your critter warm. This pouch makes it easy to carry your critter at your side leaving your hands free, especially while sitting at a table or desk. It is lined for added warmth. It has a handy outside pocket to carry your wallet, bottles, food or other pet supplies. Velcro is used to assure safe closure on pouch and outside pocket. Machine washable in cool water. Available in three sizes. You'll enjoy the freedom you have with this pouch. Carry your pet in front of you with your hands free while giving your pet the comfort they need. Padded shoulder straps can cross in the back for your comfort. Handy pockets in front for supplies and a zipper front opening can easily be adjusted to allow your pet to look out. Lined inside. Machine washable in cool water. Available in one size only. Your pet will be safe and warm while sleeping in this hanging pouch. It hangs inside the playpen with a front opening for your marsupial to look out. Comes with easy spring sliders on the strings for easy adjustments. Made of soft cotton and is reversible and machine washable in cool water. Available in three sizes. This pouch is very versatile. It is made of soft flannel and is reversible. The double thinkness of material helps keep your pet warm and cozy. Can be used alone or fits in any of our other pouches. The curved front assures your pet comfort while hanging out. Designed with a flap to cover your pet for privacy and quiet, or the flap can be used to pick up your pet safely and securely when removing it from an outer pouch. Machine washable in cool water. Available in three sizes. Helpful Hint: Always use the Inner Security Pouch as a liner inside any pouch for added warmth, for security while bottle feeding, ease of removing your critter from it's pouch, and as a diaper to help keep the outer pouch cleaner. 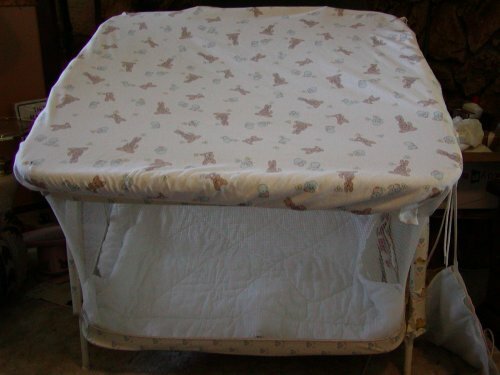 Keep your pet safe from harm in your playpen with a Play Pen Cover. Pull back to attend your pet and keep him secure at night for a peaceful sleep. With elastic all around it hugs the play pen to hold the cover in place. For more security, clamps can be used at the corners of the play pen to give it extra hold. Made of soft cotton to allow air and light to flow through and is machine washable. Comes in two sizes: Large for Standard size play pens and Small for Travel size play pens. (Clamps not included).